is to know God and to experience freedom as whole persons through Jesus Christ; to develop a creative, supportive fellowship; and to expand concepts of mission through participation in the global ministries of the church. In our monthly meetings we do this by having an ice-breaker that allows us to know and support one another; devotions and programs that help us to know God; and actions we take to participate in the global ministries of the church. 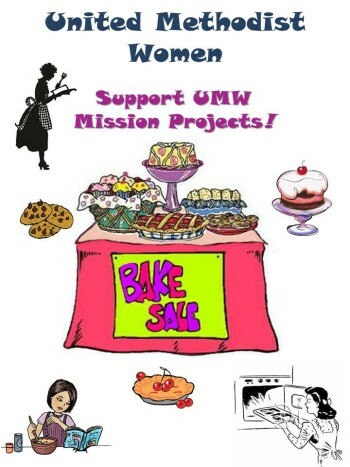 Please support the UMW Bake Sale on the 1st Sunday of each month! United Methodist Women is a faith-based membership organization of laywomen within The United Methodist Church. We are organized for mission and our members are committed to growing as disciples of Jesus Christ in community with other women and building the lives of women, children and youth. United Methodist Women has been in mission for more than 140 years. Our entire program focuses on mission. Our mission initiatives include providing opportunities to grow spiritually, equipping women and girls to be leaders, providing transformative educational experiences, organizing for growth & flexibility, and working for justice through service and advocacy. All women of the church are invited to join us to create a supportive fellowship and to expand concepts of mission through participation in the global ministries of the church. will host the Bridges District United Methodist Women’s Spiritual Retreat on Saturday, March 11, 2017. Please join us as we rejoice in fellowship, led by a spiritual leader. For more information see Miraflor Spingola, 553-2645, Wayside UMW President. Our Project Linus blanket program began in 2009. Pauline Ramsay saw an article about the program that gives blankets to traumatized children in Solano County. It is a national program but we work with the Solano County Chapter. At that time, in August 2009, we cut the fleece into blanket size pieces. We then cut the edges into about one-inch segments and braided the edges. We did 14 in 2009. In August of 2010 we did 32, in August of 2011 we did 56 and in 2012 we did 92. In 2013 we changed from making the blankets only at the August meeting to making the blankets year-round. Then the fleece was cut with holes for crocheting the edges on them. Members could take the fleece home to crochet the edges and return them at our next meeting. In 2013 we gave 102 finished blankets; some completely crocheted, some knitted, as well as the fleece blankets. In 2013/2014 283 blankets were donated. Since September 2014 up to the present, 443 blankets have been made. That makes a total of 1,022 blankets that we have given Project Linus since we began this ministry. We thank the many women who have helped in this ministry – Karen Hester, Billie Cowgill, Gladys Polanco, Betty Schulz, Sharlee Beasley, Pauline Ramsay, Miraflor Spingola, Lina Mangayayam, Annette Kee, and many others, some not even members of UMW. Thank you to all!